This is an observation that stems from a personal experience, you could consider it a rant if you please. I had accumulated quite a few reward points on my credit card. I am the type of customer the credit card industry would call a deadbeat. With our anniversary and wifey’s birthday falling in the same week, I decided to use some of these points and order something nice. I set off on my journey through the credit card provider’s website hoping to come across a catalogue from which I could choose and order. I discovered soon enough that things have changed on the rewards program side of the credit card industry too. I did mention I have “accumulated” these points over time. The last I had ordered was exactly like I mentioned, a catalogue of items from which you simply picked up stuff and ordered. The newly organized (at least for me) rewards program offered dozens of vouchers that you could procure and subsequently shop with. For lazy folk such as yours truly (I am sure the women folk out there would have labelled me that the moment I said I wanted to get something for my anniversary and wife’s birthday from a reward point catalogue!) going to malls and shopping is not a preferred option. The other option of course was to do online shopping using the reward points accumulated. This could be done at a “partner online site” which I did. I picked a couple of items and checked out having paid with my reward points. I promptly received an email promising delivery within 10 days. Reasonable I thought since I had 12 days to go for the anniversary. All leader sites at least the ones that I have shopped with progress your order through various stages from receipt to order being placed to vendor to staging to shipping and ultimately deliver. What’s more they send e-mails and SMS informing you of progress. None of that happened in this case. Anxious whether the gift would indeed reach in time for the birthday if not the anniversary I placed a call to the customer care who had no new information to offer save the standard “Your order is being processed Sir”. I specifically asked whether they’d able to ship at all and was willing to change my order to some other product that could be. Assurances were given and accepted. Cutting to the chase, despite repeated calls to the customer care centre, emails and tweets no information was shared and one fine day after 30 days of placing the order I got a quiet message on twitter saying they couldn’t execute my order. The tale of woe doesn’t end, now I am forced to utilize the considerable amount of money again with the same online shopping portal, since they (as stated) do not have a process to refund cash against the points nor can they reverse/re-instate my points to the credit card provider. Now for the brand angle. Here’s a service provider who is supposedly treating me “nice” by rewarding my use of their service. By logical extension of the premise the reward experience is owned by the primary brand which is the credit card provider. The role of executing/making tangible the reward experience is performed by the secondary brand i.e. the online shopping site. Since the primary brand has pre-chosen with whom I get to shop, the responsibility of the experience is theirs. A bad service rendered by the secondary brand as is a reflection on the primary brand. This is no different from the normal course where brands chose partners for delivering their services either through retailers, franchisees etc. The brand is responsible. Outsourcing is good but brands, more importantly the people running them should be aware that outsourcing a process does not transfer the accountability of the process. Regardless of which part of the operations the outsourced process lies in there is no absolution! A brand that does not or cannot provide top notch products and services to its direct consumers will invariably falter, more so with indirect consumers/customers. Therefore killing your brand! A simple mantra so that you don’t end up sleeping with your enemy is being accountable. NO ESCAPE! Need: Before entering into partnerships, one must be absolutely certain that the service or component of your service that is being outsourced to a partner brand is not a core capability. The value add of another brand is significantly higher than what you could achieve alone. Objective: It is necessary to have a clear idea of what we are going to achieve by virtue of entering such a partnership. Common sense? Yes. Do we all think this through? Doubtful. Evaluate: The worst mistake one can make is hop on to the first train that comes in. Age old wisdom requires us to compare the offering and relative strengths of the suitors. Again something that tends to be overlooked. Select: We tend to go for the familiar. Give the job to someone who already works with us. They are looking to expand, have some competence and a great relationship already exists so why not continue it. Strategic partnering is about the strategy and not the partnering per se. The basis of selection should be basis congruence and competence only. Relationship at best can have a weight but cannot be the guiding factor. Communicate expectations: We know what we need, what we need to achieve. Now communicating it in a clear, unambiguous and unequivocal manner is necessary. 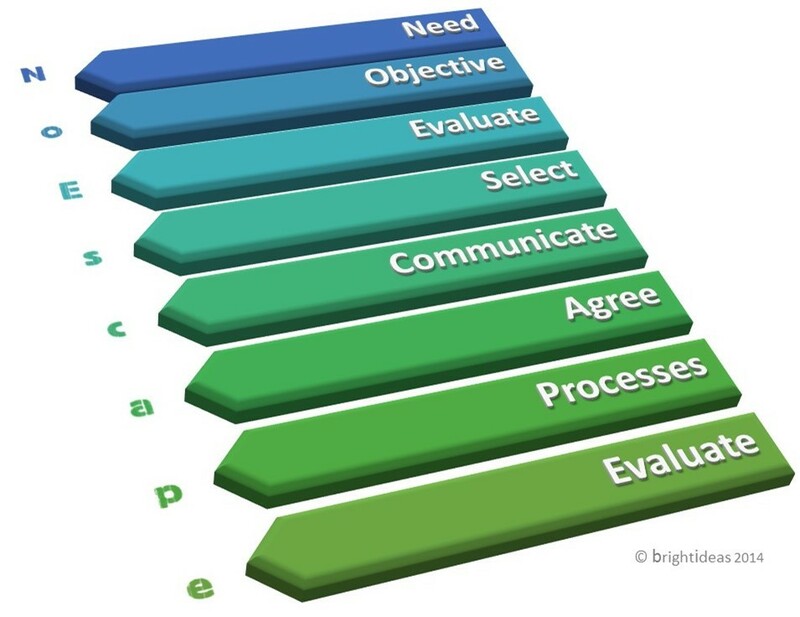 Agreed deliverables: It is important for the partner to see it from your perspective. Agreement should be the outcome of having shared and communicated rather than just a contractual obligation. Processes: Having done all the hard work, processes and their metrics should be defined and measured. As they say you cannot analyse what you don’t measure. Evaluate periodically: Corollary to the above you cannot improve unless you have analysed. The above is applicable regardless of you choosing a vendor, an agency or a strategic partner. Better safe than sorry!